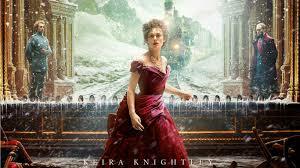 Set in Russia quite some time ago, Anna Karenina tells the story of Anna (Keira Knightly) who is happily married to the staid and steady (and boring) older man, Karenin (Jude Law) until she meets the charming soldier, Vronsky (Aaron Taylor-Johnson). They cause a scandal in society with their flirtatious looks and dancing and eventually their love brings them both down. This is an extremely beautiful film. Cinematically stunning, with the theatrical absurdity that I have long loved from Tom Stoppard. For me, the film was a bit long, but it was so stunning that I didn’t mind. I didn’t even mind Keira Knightly’s pouting or the long, drawn-out shots with the single tear slowly tracking down her face. It was worth it even just for the spectacular dance sequences with the languid and stunning movements. I wish I’d seen it on the big screen.